Have You Broken A Wrist? Men Are At Risk Of Osteoporosis, Too : Shots - Health News A broken wrist may not seem like much, but it can be the first sign that you're headed for a broken hip or spinal fracture. Men often don't realize they are at risk of osteoporosis as they age. A man who breaks a wrist after age 50 is more likely to die prematurely than a woman with the same injury. When a man shows up in her office with a broken wrist, Dr. Tamara Rozental will often suggest that he get his bone density checked for osteoporosis. She often gets a blank stare back. "I may order the bone density scan and tell them they should get it, but many of my patients don't do it," Rozental, an orthopedic surgeon at Beth Israel Deaconess Medical Center, says. That worries her, because a wrist fracture is often the first sign that bones are becoming weaker. If someone middle-aged or older breaks a wrist, it could mean they're on track to break a hip or a vertebra 10 or 15 years later. 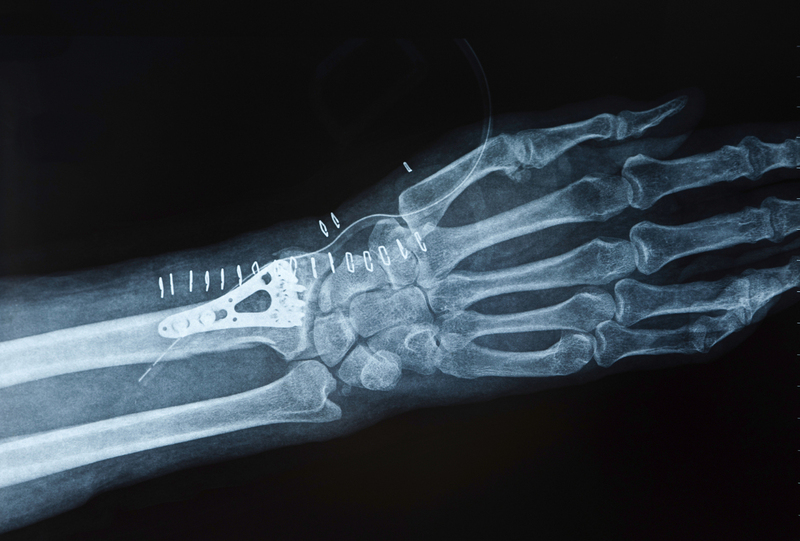 "If you have a wrist fracture to me you're automatically at risk of having another fracture later," Rozental, a wrist fracture specialist, told Shots. And osteoporosis isn't just for women. Up to 25 percent of men over 50 will break a bone due to osteoporosis, and one-third of hip fractures are in men. But men aren't getting the medical attention that could help protect their bones, Rozental says. In a study published Wednesday, she found that while 53 percent of women over 50 get referred for bone density testing after breaking a wrist, just 18 percent of men did. And where more than half of women started taking calcium and vitamin D supplements after breaking a wrist, just 21 percent of men did. Unfortunately, half of the men who did get a bone density test were judged at risk of a second major fracture due to osteoporosis in the next decade. The study looked at the records of 439 people over age 50 who were treated for a wrist fracture between 2007 and 2012. It was published in the Journal of Bone & Joint Surgery. There are a lot factors affecting the risk for osteoporosis, some of which, including family history and genetics, are outside of anyone's control. But habits can affect bone health, including weight-bearing exercise (good) and smoking and drinking alcohol (both bad). Rozental says a man who breaks a wrist should ask his doctor if it should be investigated further. "It's a little bit of a wakeup call."